In this video you’ll get a completely unbiased review of the strengths and weaknesses of these 3 lenses. This video was created by Tony Northrup and he does a great job breaking this lens down for you. In order to make sure you get an unbiased opinion on these lenses I’ll keep quiet about my opinion. You can watch the video and decide for yourself. Hi, I just wanted to say that I loved the video and I really like that you don’t talk down to people. You use relatively easy to understand terms and layman’s language in a really casual style that I appreciate. You come across like one of the guys not someone who puts himself up on a pedestal because he’s a professional photographer. thanks. Wonderful video. Very informative. I have a Canon 60D and Sigma lenses. I’m glad to hear that paying the difference for the Canon lens isn’t necessarily going to change my result. I need the full frame camera. Other than nature shots my main focus is concert photography. I have been shooting with media access for about 8 years and keep finding ways and tools to get better results. My belief is that this has to be one of the most challenging genre’s to shoot. Rapidly changing lighting (dark, light, colored), moving target, obstructions (mic stands, guitar necks, etc), no control, people in the way, and so on. I would love to find a professional that has tips and suggestions for shooting this type of event. I think I do pretty well, but there’s alwasy something new to learn. Does anybody know of such a resource? Once again, very nice video. I purchased the Tamron 70-300mm f/4-5.6 Di VC USD lens after much deliberation & research. I had initially wanted the Canon L version but went for the Tamron after doing my research and because it was about a third of the cost of the Canon lens. So far, I’m absolutely delighted with it and so glad that I saved my self many hundreds of $’s! Excellent review Tony ! Well explained and to the point. Don Thorne, Carl Carlson, Rick Crawford…. Since F/Stops determine DOF, why isnt every lens set to the SAME F/Stop to have an apples for apples DOF comparison.. ??? AND why are the final shots not raw from the camera and already photoshopped ?? Not sure what this was meant to show, other than framing at different distances.. I have the Sigma. Excellent lens! Canon is ever so slightly better but I’ll pass on the price. Fantastic detailed comparison and very sensible recommendations for different purposes users! Thanks so much . Prefer my Canon 85mm 1.8 for portrait work over my 70-200 2.8. It’s funny, I’ve watched the video several times over the months and each time, I don’t see the things this guy Tony is pointing at and I actually see quite a bit that he doesn’t point out. I also note that he is comparing the v1 instead of the FAR superior v2. Only you can decide if it’s worth the extra cost though and if you’re shelling out the kind of money required for a 5Dmiii or better, why short cut on your glass? The Canon has a number of real advantages including weather sealing, better image stabilization, higher maximum magnification and super fast and accurate auto-focus when tracking moving subjects. The Sigma also has a real issue with the focus breathing (the closer you get to a subject, the shorter the focal length) and that there is much more copy variation than with the EF 70-200 f/2.8 IS II. One shouldn’t have to send a brand new lens back to the manufacturer but that is what is required all too often with Sigma. If money is an issue strongly consider the 70-200 f/4 IS before the f/2.8 Sigma. You’ll get better low light AF with the f/4 IS Canon and, unless you are right on the edge of not enough light, you can bump the ISO to compensate. If you absolutely need f/2.8, fork out the money for the Canon (version II). When spending this much money, why would you want to second guess whether the dollars saved were worth it and why low light action shots have such a high rate of missed focus. The Canon Lens dropped $500 since Tony created that video but still costs a lot more than the Sigma or Tamron. I used this video to help me decide but ultimately I did choose the Canon because of the focus breathing he pointed out. Thanks for the information! I went with Tamron….. no one hears that noise in a loud bar, and it delivers! You gave me some great food for thought…. I did a few side by side test with the Canon and the Tamron. I was actually saving for the Canon when the Tamron was finally released. I actually had $1500 saved towards the Canon. After my SIDE by SIDE photo test I was actually impressed how much SHARPER the images were using the Tamron. Also the colors were more rich right out of the camera. Detail was phenomenal. I was sold and have been happy with my purchase. After using this lens for over 2 years maybe almost 3 I can say that the lens holds up well and produces some phenomenal shots. There is NO need to spend an extra $1000 for the Canon version in my opinion. As he says in the video….you can use that money towards many other things for your photography. The Tamron came with a $100 rebate when I bought it and a 6 year warranty. Totally happy with my purchase. I actually bought that Tamron 70-200 2.8 earlier this year. I have used it off and on for various activities. Hockey games, a wedding and some birding. I was recently unsure of my choice of it and wondered if I should have made the bigger investment and gotten the Canon 2.8. I was wondering if the image quality would be much different, thanks for answering that question for me. I do find that when I zoom in extremely on a image taken with the Tamron it seems that it pixelates quicker and almost very squarely. I will continue to use it and be a little more confident in it’s results. Daniel LowLife Trujillo whatcha think ? 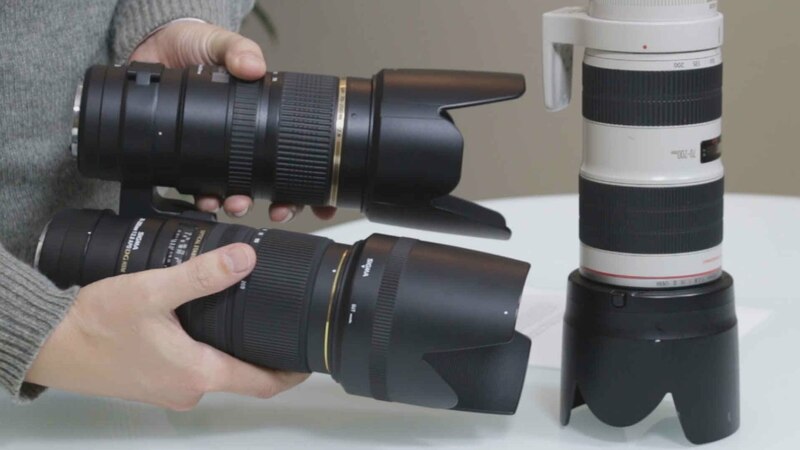 The sheer weight of the canon lens tells you that your holding a much higher quality lens. Metal, and glass with little plastic. I pay for the name, because canon stands for quality and they back their product. Canon is awesome. I’ll stick with them. Tony; as usual Great review! We always like the balanced reviews you and Chelsie put together. We’ve used the Tamron 70-200mm lenses for about two years for portrait and weddings with great pics and no problems. Guess we don’t sling them around too often – LOL. As for the focusing noise you here? I didn’t know if you have a bad copy or just really sessivive hearing, but the two we have seem quite and never seen anyone look toward us when focusing ?? Yah Thanks again for the review.